Motorcycle accident lawyers in Fort Myers, Naples and Punta Gorda-Port Charlotte remind new riders that the law now requires a rider safety course before new riders can obtain a motorcycle endorsement. 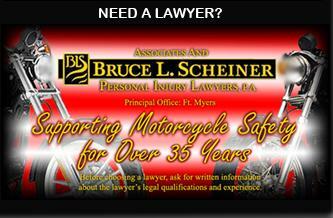 “I can’t express the importance of taking a rider safety course enough,” said Bruce L. Scheiner, founder and senior attorney of Associates and Bruce L. Scheiner, Personal Injury Lawyers, which has been fighting for motorcycle rights and representing motorcycle accident victims since 1971. The firm publishes a website dedicated to motorcycle riding and safety in Southwest Florida. Visit www.flbikers.com. Click on the safety link to visit a list of approved rider safety courses throughout Florida. The website provides contact information for safety schools by city and county, including Naples, Fort Myers, Cape Coral, Lehigh Acres, Bonita Springs, Punta Gorda and Port Charlotte. The state of Florida made the courses mandatory for new riders after July 1, 2008. The courses are $200 to $300 and motorcycles and safety gear are provided. Graduates are then eligible to get their motorcycle license through the Bureau of Motor Vehicles without additional testing. If you or someone you love has been seriously injured or killed in a motorcycle accident, there are certain things you can do to help protect your rights. Motorcycle accident attorneys and personal injury and wrongful death lawyers offer free appointments to discuss your rights at offices throughout Southwest Florida, including Fort Myers, Naples, Cape Coral, Port Charlotte, Arcadia, Sebring and Venice.